066. 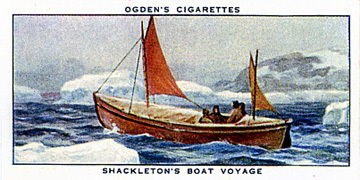 SHACKLETON'S BOAT VOYAGE. Issued by Hignett Bros. & Co. (Branch of the Imperial Tobacco Co. (of Great Britain & Ireland), Ltd. [Also issued by Ogden's (Branch of the Imperial Tobacco Co. (of Great Britain & Ireland), Ltd.] (1939). Card number 49 from a set of 50 entitled "Sea Adventure". Size: Ca. 2.68" x 1.4". Recto: View showing the James Caird under sail with ice and rocky shore in fore- and background. At top: Hignett's Cigarettes [Ogden's Cigarettes]. At bottom: SHACKLETON'S BOAT VOYAGE. Verso: SEA | ADVENTURE | A SERIES OF 50. | SHACKLETON'S BOAT VOYAGE | When Sir Ernest Sbackleton's Antarctic expedition ship Endurance foundered in 1915, her crew managed to reach Elephant Island, which was so seldom visited that they were little better off than on the ice. Leaving twenty-two of them in shelter, Shackleton and five others made a desperate attempt to get help from South Georgia. A terrible 800-mile boat journey was followed by a tramp across frozen mountains never before explored, bful effort, and being three times beaten back by the ice floes, the whole party wm rescued. | ISSUED BY | HIGNETT BROS. & CO. [OGDEN'S] | BRANCH OF THE IMPERIAL TOBACCO CO. | (OF GREAT BRITAIN & IRELAND), LTD.